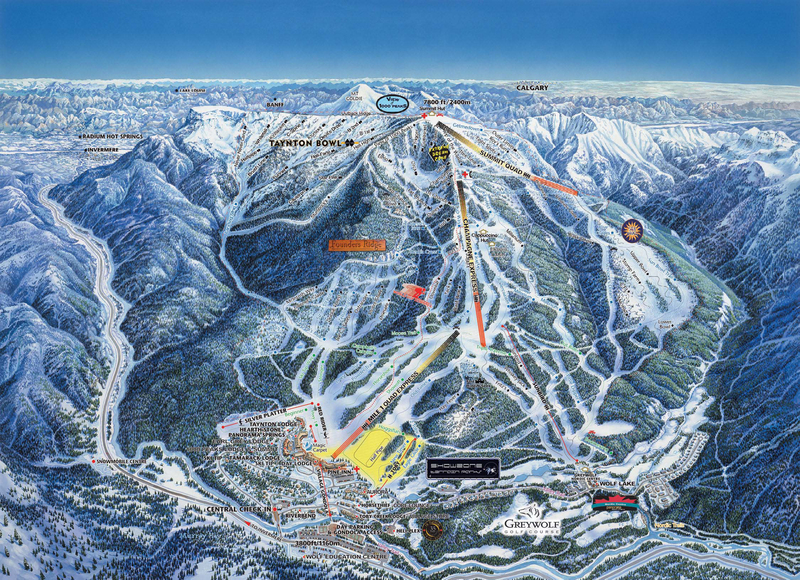 Panorama features 2,847 patrolled acres of beginner, intermediate and expert terrain accessed via 9 lifts. Skiers and boarders won't want to miss Panorama's newest and largest terrain expansion ever - Taynton Bowl. Formely exclusive heli-skiing terrain, Taynton Bowl is now lift accessed backcountry style skiing incorporated into Panorama's official boundary. Other then the unbeatable mountain terrain, guests will enjoy the always expanding Panorama Mountain Village. Explore the varitey of shopping, gift stores and local businesses such as RK HeliSki which has been taking skiers and boarders to new heights for 38 years. During the summer months Panorama transforms into a hub of outdoor activities and events. Experience what some considered the best mountain biking terrain in British Columbia, or push your personal envelope with a white water rafting trip and adventure tour down the Toby Creek. If you prefer to stay on dry land and are looking for something a little slower paced consider a relaxing ride up the chairlifts, followed by a hike about the mountain while taking in the scenic mountain views. No matter what activities you choose to fill your days with, you can rest assured that OKChalets will take care of your accommodations. Each of our premium Panorama rentals is sure provide your group with an unforgettable alpine experience. Enjoy returning home after a full day on the hill to a private chalet, roaring fire and a mug of hot coco. Regardless of your group we have the perfect Panorama lodging for you. Located in the province of British Columbia in the Canadian Rocky Mountains, 308 km west of Calgary. Take Hwy 1 west to Hwy 93 south to Invermere. Panorama is 18 km west of Invermere. Perched at nearly 7,000 feet on Panorama Mountain the Elkhorn Cabin offers awe-inspiring views of the Purcell Range's craggy spires. The newly expanded cabin now offers memorable lunch dining, an excellent "All Canadian" menu and warm hospitality. Reservations are always recommended. Experience a magical sleigh ride in the clear mountain air as you travel through the snow-covered forest trails. The sleigh ride takes you to the secluded Trapper’s Cabin where you will enjoy a hearty chilli cookout and campfire. The ride takes approximately 40 minutes to complete and is followed by hot chocolate and marshmallows. On the edge of the famous Bugaboos, R.K. Heli-Ski at Panorama Mountain Village comprises 2,000 square kilometres and part of the largest heli-ski region in the world. With annual snowfalls of up to 1,100cm(36 feet), the spectacular scenery, expansive glaciers and quality glade skiing offers skiers and snowboarders the adventure of a lifetime! You don't have to be an expert, daily heli-skiing is at a comfortable pace and is always in a group supervised by a certified professional mountain guide. Children 5-14 years have great times learning and exploring with their new friends. Ski and snowboard groups are categorized by ability and age. Special fun theme such as scavenger hunt day and report card day are featured weekly. Looking for a way to see Panorama Mountain the way the locals do? Want to see where your level of skiing ability will take you on the mountain? Look no further than to our Mountain Friends! These friendly folks know all the best terrain and are willing to show you where to get the best turns. Let our Mountain Friends be your guide to the mountain. Explore over 20 km of groomed and track-set cross-country trails departing from the Greywolf Nordic Centre. Open Daily until April. 9am to 5pm. With over 32,000 acres of terrain, we are able to offer you the snowmobile tour of a lifetime. Each tour is unique and the experience unforgettable! All trips are catered to the first timer or to the seasoned Pro. Sit back and enjoy the scenery during this 2 hour dog sled tour. Your experienced guide will lead the dogs through incredible mountain wilderness. Feeling adventurous? Ask about learning how to mush and lead the team on your way home! Feel the difference at SolSpa, located at the Pine Inn. Experience a wide variety of treatments such as relaxation massage, deep tissue massage, craniosacral therapy, body wraps, hot stone massage, mud treatments, reflexology, plus manicures and pedicures and more... Enjoy professional services with qualified practitioners in a relaxing environment. Nurture yourself! Enjoy this informative, and energizing snowshoe tour lead by the knowledgeable local guides at Panorama Mountain Resort. The excursion will take you through the forest providing exceptional views of the valley and its snowy mountain peaks. Head over to Fubuki Sushi for authentic Japanese cuisine and some sake to warm up before heading back to the village.